When we launched Wealthfront in December 2011, the thought of getting to $1 billion in assets under management seemed audacious. 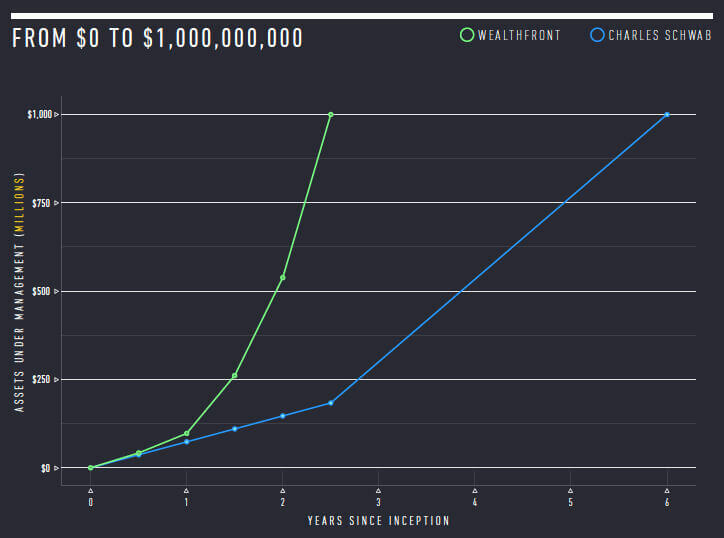 Today, I am proud to announce that not only has Wealthfront attracted more than $1 billion under management; we have managed to do so in less than two and a half years since launch. This is an incredibly gratifying milestone for the team at Wealthfront, and we couldn’t have done it without the trust and support of each and every one of our clients. There is no question this accomplishment would not have been possible if not for our focus on two things: Millennials and product innovation. Wealthfront is on the leading edge of a very large trend catalyzed by a new generation of investors. There are over 90 million Millennials in the US with an aggregate net worth of more than $2 trillion; by 2018 that is expected to grow to $7 trillion. This generation has a very different set of expectations about what they want from an investment service. Millennials grew up with software and expect services to be delivered online. They don’t have the patience to have to talk to someone to complete their transactions. They lived through two market crashes and are highly cynical about the claim that you (or anyone) can outperform the market. They have been nickel-and-dimed through a wide variety of services, and they value simple, transparent, low-cost services. Most importantly, Millennials want to pursue their passions. Whether that be their careers, hobbies, families or otherwise, most do not believe that their path to success lies with actively managing their investments. Overwhelmingly, they seek an investment solution that is automated, index-based and low-cost. In other words they want an automated investment service. In just two and a half years, Wealthfront has dramatically enhanced our service with a number of innovative new features: Daily Tax Loss Harvesting in 2012, the Wealthfront 500 in December 2013 and most recently, Selling Plan in April 2014. One of the best attributes of a service built on software is that it can be rapidly and relentlessly improved. The secret to our record of innovation is simple: We look to the highest value services typically provided to the ultra-wealthy and then automate them in software so they can become broadly available. The question we ask is simple: What can we do next to best improve the long-term results of investors? The result? When our clients sign up with Wealthfront, they receive not only all of the incredible features the service offers today, but they also join a service that keeps getting better. Reaching $1 billion in assets under management is an accomplishment of which we are very proud, but it’s only the beginning. We think there is a huge audience of investors that can benefit from our service. In 2012 Chuck Schwab told our co-founder Andy Rachleff that he saw incredible parallels between what we were doing and where he started. He said that when he launched his discount brokerage service in 1975, the only people crazy enough to place an over-the-phone trade to a pool of unknown brokers were young people in their 20s and 30s. Today Charles Schwab’s average client is in their mid-50s. Over the past 39 years, Schwab has grown with the Baby Boomer generation to $2.3 trillion in client assets. It took Charles Schwab six years to reach its first $1 billion in assets. More impressively, they took a similar amount of time to go from $1 to $10 billion, and again from $10 to $100 billion and $100 billion to $1 trillion. 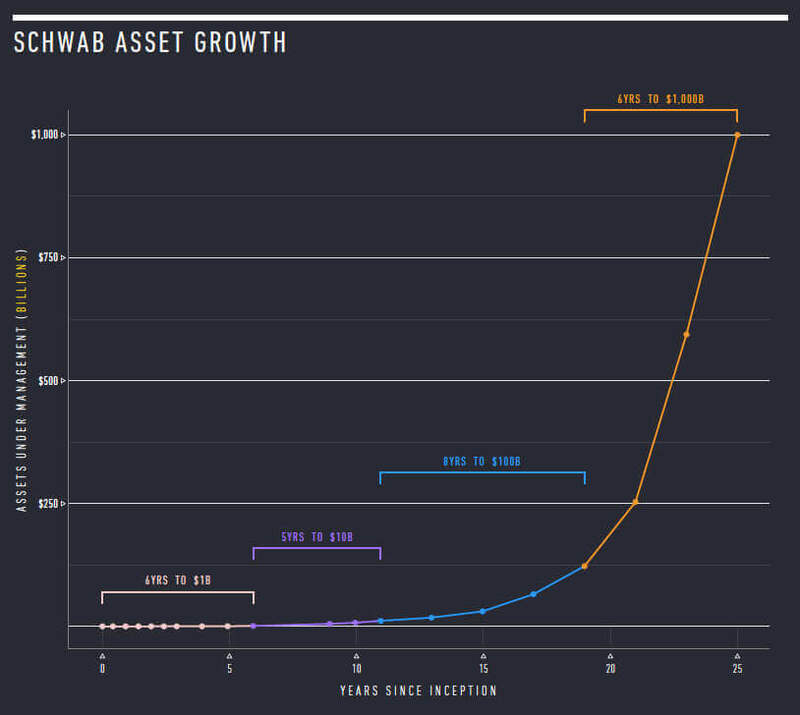 Wealthfront reached its first $1 billion in assets in less than half the time it took Schwab. We hope that by focusing on Millennials the way Schwab focused on Baby Boomers, we can continue our rapid growth to $10 billion, $100 billion, and beyond. We have a once-in-a-generation opportunity to build an exceptional company, the way that Charles Schwab was built decades ago. We’re just getting started. Join us on the journey.